Caught about a half hour of home before dark the other day. She just lit up the screen-even in black and white. Black Narcissus! What a beguiling unsual movie. And the use of Technicolor is nothign short of astonishing. I found the book at an estate sale two years ago and one of these days I get around to reading it. You forgot ELMER GANTRY. What a pairing with Lancaster. And Spartacus, too, in a minor role. And wasn't she in a noir movie as a tempting femme fatale? Can't recall the title. I'm checking imdb.com. ...Pause... YES! I knew I was right. Angel Face with Robert Mitchum. That was a good one with her a schemer and Mitchum for a change as the victim. If you haven't seen that one, do so soon! It's definitely available from Netflix. Patti: Yes, she was one of those actresses whom the word 'incandescent' was invented for. HOME BEFORE DARK was one of her best performances, I mean, your heart just broke for her. Rhonda Fleming almost steals the picture, though. I think that was Fleming's best role. John: Those three are not on my Favorites list. (Nobody's perfect.) Ha! I can't quite feel comfortable with Jean as a schemer and seductress. It's just me, I know, since everyone loves ANGEL FACE. It's a noir classic. Good movie ideas, will check with the library on what they have, and now on TCM, too, now that I got the point that there is a posted schedule (how could I not know? ), but I'm glad I know now. I liked Jean Simmons, too, among others. Another actress I worshiped was Greer Garson; she was so perfect in Mrs. Miniver. There really is a goldmine is classic movies. 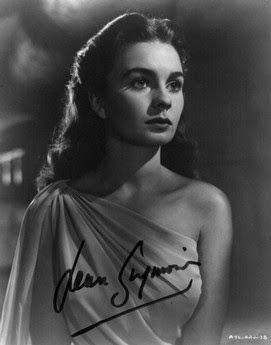 I love Jean Simmons too. Have you seen Young Bess? Life of young Elizabeth I with JS's real-life husband Stewart Granger as Tom Seymour & Deborah Kerr as Catherine Parr. Ridiculous as history but so beautifully done. JS's costumes are gorgeous. Kathy: TCM is a definite goldmine. They do such a great job of bringing vintage to a new audience. If it weren't for them, I don't know what would happen to all these great films. They were meant to be seen!